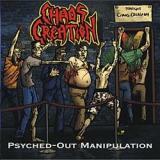 With Psyched-Out Manipulation, Chaos Creation beefed up everything from their first demo. The production is quite impressive for a demo and the much-craved bass-frequencies are given added ballsyness – something this reviewer always hearts. The music took a bit more technical route as well as the basic thrash was introduced to a lot more speed metal and a lot of groove from time to time as well. Head-On Turbulence – quite the amusing story about dumb machos on a drunk driving-expedition Carmageddon-style, apparently – starts off with ominous mid-paced riffs and lead melodies that somehow feel very twisted. In a good way. Vocalist Triple A has still the hoarse punkishness in his voice but it has been met with a lot of snarly qualities that are challenging to describe. Think like sarcasm fused into vocal form – could we use Suicidal’s Mike Muir here as some sort of measurement? A’s vocals ache towards the bandana-master, but not yet getting there. Still, definite improvement from Dedication For Annihilation. The chorus of Head-On brings some heavy, Pantera-style grooves in and one can’t help but bounce along while the hair is flying. The bridge thrashes it down with an insane riff to form a very versatile tune. Total Thrashing Dreamstate reveals pretty much everything necessary in the title as the tempo is high and the feeling raw. I’d say the killer tune harkens back a lot to the gritty vibes of Kreator and the German thrash masters. Triple A’s extended yelps can get pretty gruesome to listen to if they aren’t your type, but on the other hand, they fit the psychedelic theme of the song really well. Overdue Fallout stretches towards very giddy heights and succeeds moderately. The 7-minute thrash behemoth begins with acoustic eeriness and chugs with a mid-tempo power that I think would have been served better if left a couple of minutes shorter. Great solo with the nutty whammy bar-tricks, anyhow. With this second demo, Chaos Creation expanded their sound into many different directions and is a very interesting listen considering all the different elements and how they often work. They would streamline their attack for the third promo, but Psyched-Out Manipulation is still very recommendable listening for fans of thrashier music with an edge.